For all those doing their jobs in industries imposing major hygiene constraints, the WHITE range has been designed with a one-piece upper, without assembly stitching. Made with a new thicker material Dry-Tek®, this range offers maximum resistance against chemical risks and ensures optimum hygiene with its Cambrelle+ Amicor® antibacterial lining and "refreshing" treatment: the fibres are treated to eliminate bacteria and fungi, and to combat perspiration odours. This lining is made using a new process: a micro-encapsulated deodorant is released by rubbing to ensure lasting freshness. Ideal for : food processing industries, medical, restaurants and laboratories. Dual density high pressure-injected PU for reduced weight = less than 800 g a pair! 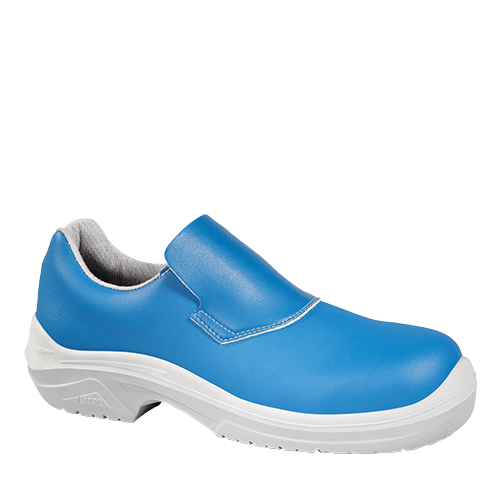 Insole lining made of antibacterial, antimicrobial and antistatic latex foam, great absorptive capacity and abrasion-resistance.